Thin is in. Sales of thin clients have more than tripled since 1998, when 350,000 units were sold, according to a survey by International Data Corp., a market research company in Framingham, Mass. Sales reached 1.2 million last year, and most analysts predict the total to exceed 6 million annually by 2003. Thin clients get their name not from their size or shape but from the way they function in server-based network architectures. 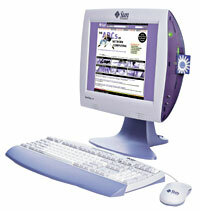 The Sun Ray 150 from Sun Microsystems Inc. includes a 15-inch LCD monitor, contains no CPU and runs SunSoft Solaris. It's priced at $1,399. Unlike the fat local clients that share the processing load with servers in client-server and distributed computing models, thin clients are used exclusively as windows to the servers. Only the servers process applications and data. The thin clients are used solely to display the applications via monitors and may also serve as limited input/output devices via the keyboards, mice, scanners, bar code readers, printers or fax machines attached to their parallel, serial or USB ports. Because thinness is determined by function, not shape, any device, including a PC, can serve as a thin client. The heavy and slow dumb terminals that displayed text from central mainframes on monochrome screens during the mid-1970s and early 1980s were among the earliest versions of thin clients. Nowadays, plenty of older 386 and 486 Intel PCs are being pressed into service as thin clients. NetPCs, a hybrid category of PC-like devices minus floppy drives and expansion ports, also can fill this category. But unlike thin clients, units with hard drives can also store and process applications to act like mini-PCs. Look across the counters of airlines, travel agencies and car rental companies and you'll see an entire range of general-purpose terminals that also serve as thin clients. They look like computers, but they are little more than keyboards and monitors with embedded chips and direct network access to a central computer. They have no hard drives or floppy drives and their only purpose is to access and display information from a main computer and enter new information such as schedule updates into a mainframe or series of high-end workstations. The ThinStar 200 from Network Computing Devices Inc. has a 100-MHz NEC R4300 processor and runs Microsoft Windows CE. It's priced at $499 and does not include a monitor. This Buyers Guide features thin clients that run Microsoft Windows, Unix or Linux. These units are next-generation versions of the general-purpose terminals. Like the general-purpose terminals, they contain no moving parts'no spinning media in the form of hard or floppy drives or fans'and they store and process no local applications, with the possible exception of a Web browser or optional terminal emulation software. Their processors are not exceptionally fast or powerful because they are used mostly for system booting, I/O needs and windowing tasks. Most of the thin clients listed run Windows CE, although Linux and Embedded NT are making inroads into the marketplace, as well. Aided by sophisticated network operating software from Microsoft Corp. and Citrix Systems Inc., the terminals can inexpensively serve up your favorite PC server productivity or business software, including Internet browsers, complete with graphics, pictures and sound. Why buy thin clients? They aren't for everybody. Knowledge professionals prefer to be in charge of loading and unloading their own applications. Many power users want to be able to unscrew a machine's cover and tinker with the insides. Content creators such as engineers, computer-aided design users and graphics designers are better off with PCs or high-end workstations with enough horsepower to handle high-end computing tasks. Positive TCO. According to a recent estimate from the GartnerGroup Inc. of Stamford, Conn., the total cost of ownership for running a desktop PC exceeds $5,000 annually in many organizations. TCO includes the base price for the machine and other factors such as maintenance, setup time, software administration, spare parts inventories and employee hours spent keeping a particular device up and running. In just about all these areas, thin clients offer a much more favorable TCO ration than either PCs or NetPCs. Base price. Most of the units listed in the accompanying table are priced between $400 and $900. 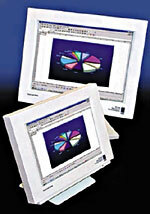 Units costing more often come with flat-panel or touch-screen monitors. Although a low-end Intel Celeron PC is priced between $600 and $800, there's much less to go wrong with a thin client device once it has been set up to run with a network server. Low MTBF rate. The base measurement of any electronic device's reliability is its mean time between failure, or MTBF. Typical thin clients have an MTBF rate of up to 170,000 hours, and most PCs have an MTBF rate of between 20,000 and 40,000 hours, according to a study by Compaq Corp.
Statistically, your networked PC is likely to fail up to five times more often than a thin client. You can reasonably expect a thin client running Windows to last seven to 10 years'or 60,000 to 87,000 hours'without failure. Acute Network Technologies Inc.'s TC-8000 Series include a Cyrix MediaGXm LV processor. Prices range from $1,399 to $1,699. Reliability. MTBF is built on the reliability of a system's components and the way it is built. As well as having no moving parts, thin clients also use higher-quality components with lower failure rates than, say, inexpensive Celeron PCs. They also consume less power than PCs, minimizing the problem of overheated components. Best of all, casual or curious users can't easily muck about the insides of a thin client to replace or swap out a part or add or delete software. Security. Because casual or unauthorized users can't load or unload software, or even tamper with a thin client's case'which often is riveted shut'the use of any unauthorized software that might contaminate the rest of the network is eliminated. Software piracy and other security risks posed by office workers or intruders are also eliminated. As for theft, a device without a hard or floppy drive, significant memory and few expansion slots isn't nearly as attractive to a thief as a full-fledged PC. Ease of management. In a multiuser, server-based environment, all software resides on network servers, making software administration, upgrades, configurations and license administration far easier than in a dispersed PC environment. Any changes to software need to be made only once and all users benefit immediately. Ease of setup and installation. The Compaq report said a PC or workstation typically takes 90 minutes to set up'30 minutes to unpack and load the operating system, 30 minutes to load applications and 30 minutes to configure the unit and attach it to the network. Compaq claims that one of its T1010 or T1015 thin clients can be set up in 15 minutes'five minutes to unpack and connect (there is no software loading), five minutes to configure the user's profile and five minutes to configure the server connection. In a 100-seat environment, the report said, the difference becomes substantial: 19 days of a field engineer's time for the PCs, three days for the thin client setup. Ease of use. Thin-client devices are increasingly used at call centers, as point-of-sale devices, at kiosks in schools and libraries, manufacturing plant floors, in hospitals and construction sites, even on ships at sea.
' Smart-card options can build a thin client's memory and PC Card options can provide dial-up capability for remote service.
' Many thin clients come with optional terminal emulation software for legacy applications. required for thin clients because all applications and data reside on the server.
' Built-in flat-panel or touch-screen monitors significantly raise the price of thin clients.
' Thin clients aren't for everybody, but they give network administrators maximum control over network activities. As mentioned, organizations wishing to act as their own application service providers can upload or download software versions from their secure servers onto thin clients at will, without the fear of intervention or sabotage by a disgruntled employee. Many models can be equipped with touch screens for public users unfamiliar with keyboards. Multilingual instructions for their use also can be provided. Performance. The performance of PCs and NetPCs are determined by such factors as the speed and power of their processors, the amount of RAM, bus types, and the speed of peripherals such as hard drives and CD-ROM drives. Thin clients have no such limitations. Because these terminals are windows into the server, they can execute applications and access data at the speed and power of the server. The only performance limitations are the bandwidth capacity of the network and the configuration management of the server or server farm. In many cases, a thin client running Windows and a slow 486 chip can outperform a Pentium PC.